Last month, wrestler Matt Hardy made a guest appearance on Syfy's Scare Tactics and it looks as though he'll be returning to deliver more scares this December. To celebrate Hardy's return to the Syfy prank series, we're giving away a a Syfy/WWE co-branded PlayStation 3 gaming system. Curious to see what the grand prize looks like? It's down below with the instructions on how to enter the giveaway. In the meantime, Matt Hardy's next appearance on Scare Tactics will have him reprising his role as a violent criminal that can't be restrained. It airs Tuesday, December 1st at 9/8c. on Syfy. If you missed his last appearance, below is a clip from the episode that aired back in October. Now for the giveaway. 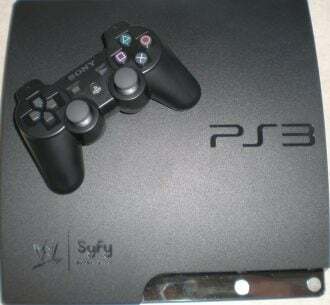 Below is a photo of the PS3, which is 120GB and includes the WWE/Syfy logo. To enter Cinema Blend’s – Syfy/WWE PS3 Giveaway, simply leave a comment below. Only one comment per entrant, please. Comments MUST be received by Wednesday, 12/2/2009 at 11:59pm EST. One winner will be selected at random. If you’re the winner, we’ll contact you via email (or Twitter, if that's how you're logging in to comment). “Guest” comments will not be eligible so be sure to log into our comment section below via Disqus, Twitter or Yahoo!. Additional rules: Cinema Blend staff members are ineligible to enter. Only entrants with a US mailing address can participate. You must be 18 years of age or older to participate. No PO Boxes please. No purchase necessary. Failure to comply with the rules will result in your disqualification from the contest.